True handmade felt is a non-woven piece of matted material made from sheep's wool, alpaca wool, angora goat or rabbit fur, llama hair, or another animal fiber. It is not the same as the acrylic craft sheets we commonly call "felt" that is found at most craft stores. My traditionally felted crafts are not woven before fulling, or shrinking, but rather are created directly from raw and/or processed dyed fibers through the felt making techniques of wet felting, needle felting or a combination of both. Wet felting involves applying extremely hot water, soap, and agitation to layers of carded or combed wool. The wool will eventually "felt" interlocking and shrinking the fibers to form a durable piece of non-woven material. This material is traditional felt, all-natural fibers forming a fabric. Needle felting involves using long barbed needles and repeatedly poking at the wool to interweave the fibers and form surface design or sculptural items. It forms similarly matted material as wet felting, but the needle felting technique usually makes less matted or dense fibers overall. These processes can often times take many hours if not days to complete larger creations like wall hangings, sculptures, and wearable items. Smaller felted items such as jewelry, pins, and wallets also take time and planning along with knowledge of the traditional and modern felt making techniques to complete successfully. I have used both skilled processes of wet felting and needle felting, separately and together at times, to create many of my funky one-of-a-kind felted items. Want to learn much more about felting techniques? Easily sign up for my newsletter to receive weekly updates with the best felt craft tutorials, tips and freebies. 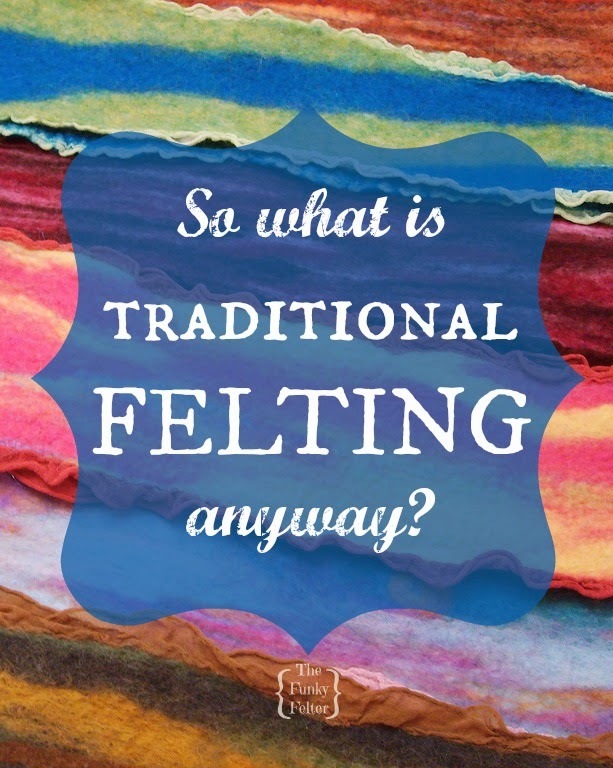 Don't miss out on the latest traditional felting info. The Felting Forum - an entire forum dedicated to feltmaking techniques. Feltmaker's List FAQ - a comprehensive list for feltmakers.